This big church seems out of scale for the narrow lanes around here, as if it was some great ship marooned up a backwater. Beached now in a faithless age, it broods silently in a graveyard cropped by sheep. 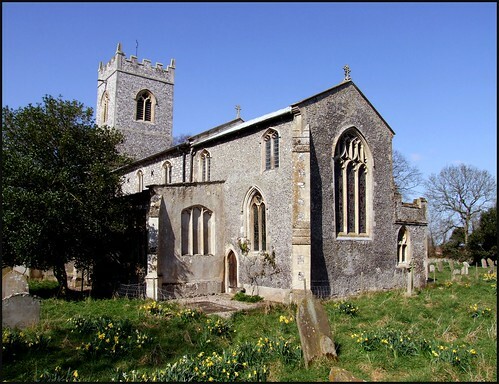 St Mary is essentially a Decorated building, with an older chancel, an unusual juxtaposition in East Anglia. Late-medieval prosperity would bring nothing more than new window tracery. The tower was rebuilt in the 18th century, but very much in the Gothick style. Mortlock called it restrained yet elegant. There is nothing so old as the recent past, and the Victorian restoration here gives the interior a wistful feel, of a time now out of sight. There are so many crisp little churches in this part of Norfolk that to come here was to sense a building which has relaxed into a still, calm decay, a slightly ramshackle feeling, which is attractive, but rather sad nonetheless. I was not a little surprised to see him with a single-barrelled gun, apparently the size of a soldier's firelock of that period, and a barrel at least a foot longer than those of my own gun, the bore as large as one for shooting wild fowl. The stock had been made by a London gunmaker, and the lock, which was particularly well finished, by the same. Mr. Girdlestone told me that the barrel came from Berlin. In the first field we came to the dogs pointed, a strong covey rose, I shot a bird, but my companion did not fire; he said the birds were too near. Shortly after, a single bird rose at about thirty yards; I fired both barrels and missed. Then the old squire coolly put up the great gun to his shoulder, and brought the bird down as dead as a stone. The distance from where we stood to where it fell must have been at least seventy yards. He gave me a triumphant look and said, 'This is my system of partridge shooting.' Mr. Girdlestone had been brought up to the bar, was an active magistrate, but was considered an eccentric character, living in a very retired way. The magisterial room of my friend might be considered as the model of a sportsman's apartment. On the walls were wooden racks containing single and double-barrelled guns, in other parts, rods for trolling and fly-fishing, with all their appendages; in the corners of the room, landing nets, a small casting net, and fishing krails. On a table might be seen a stuffed martin cat and a variety of foreign birds. The Squire's library was not large, but displayed his predominant passion for field sports, with some law books and works on agriculture. This sanctum sanctorum looked into a small but well-arranged flower garden. The heraldic glass in the south aisle was reset there, and some of it replaced, after a German bomb destroyed the Rectory and blew out all the church windows in 1941. What appears to be a parclose screen shelters the organ in the north aisle. In fact, it is the former rood screen brought here from the tiny church at Bessingham, a few miles off. Its Perpendicular confidence strikes a slightly abrasive note in this more ancient space. Dominating the south aisle is the vast monument to Sir William Heydon and his wife. They kneel stiffly beneath arcades, facing the sunshine, in the proper attitude of late Elizabethan piety. There are no children to mourn for them. The memorial seems out of scale, and Mortlock suggests that it was ordered from a London workshop and was then squeezed into the space here on arrival by sea. The piety of the late 16th century is matched in the chancel by that of the Edwardian era, with an insipid window of St Anne teaching the Blessed Virgin to read, and then the little girl grown up and holding her own child. Better is the Transfiguration in the west window, and the Crucifixion in the east with attendant Old Testament scenes, of half a century earlier. The church is big enough to be filled with white light from the nave windows, and the coloured glass seems jewel-like, not dominating, but offset by stillness and silence, which is as it should be.